What criteria must Redskins’ new head coach meet? 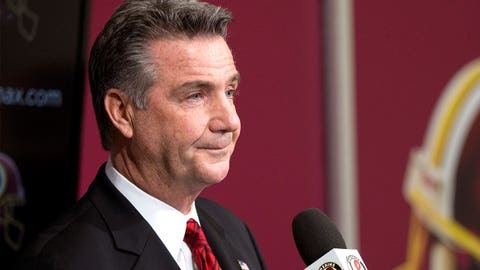 ASHBURN, Va. — Although general manager Bruce Allen said the Redskins’ plan to find a new head coach would move forward in earnest Monday night, there are two things we can already ascertain about Mike Shanahan’s eventual replacement. He won’t have the omnipotent power over Washington’s football operations that Shanahan enjoyed for four seasons. Allen now has that control. In his news conference following Shanahan’s firing, Allen expressed strong support for two members of the club’s front office (player personnel director Scott Campbell and pro personnel director Morocco Brown) having major influence in shaping the 2014 roster. Of course, the new head coach will have significant input. But it doesn’t appear he will have final say, which will cool interest from some candidates – especially those who worry that Redskins owner Daniel Snyder may begin meddling in football affairs again after stepping back during the Shanahan regime. Forging a more positive working relationship with quarterback Robert Griffin III is a must. As many flaws as the Redskins had during a 3-13 season, the year-long soap opera involving Shanahan, RG3 and a slew of supporting characters – Snyder, team orthopedist Dr. James Andrews, offensive coordinator Kyle Shanahan and Griffin’s father Robert Griffin II among them – may have been Washington’s greatest failing. Shanahan and Griffin never seemed on the same page dating back to last January’s first-round playoff loss to Seattle in which the quarterback suffered a serious knee injury. Some players who care deeply about their head coach speak out angrily when the latter gets fired. Griffin offered a “thank you” to Shanahan and other members of his coaching staff during a statement he read on a conference call, but he would neither speak on camera nor take media questions. Whomever the next head coach is probably will want answers about where Griffin’s head is and whether RG3 will buy into whatever offensive system is being installed.